This week all eyes were to be on the joint summit between the South African Development Community (SADC) and the International Conference on the Great Lakes (ICGLR) that was proposed by South African President Jacob Zuma earlier this month, but this event has now been cancelled, apparently at the behest of Angola, which currently holds the presidency of the ICGLR. 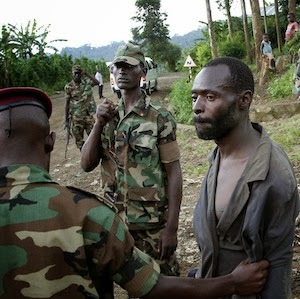 The main item on the agenda was to be the FDLR (the Democratic Forces for the Liberation of Rwanda) – the Rwandan Hutu rebel group which has been operating in the eastern Democratic Republic of the Congo (DRC) for the past 20 years, and which is the next target on the list of the Force Intervention Brigade (FIB). Some see the cancellation of the summit as a sign that the military operations against the FDLR are now set to go ahead. Operations against the FDLR have now twice been postponed – the first time in January 2014, when the FDLR leadership declared itself ready to disarm voluntarily, and the second time in July last year, when SADC and the ICGLR decided to extend the deadline by a further six months, to 2 January 2015. Until then, the United Nations (UN), SADC and the ICGLR had all been more or less on the same page on the subject: wanting to take seriously the FDLR offer to lay down its weapons, and to give it the time in which to do so. But then the deadline for the voluntary disarmament passed in May. The reception centres set up in eastern DRC to receive FDLR combatants were still empty, and the final tally of only several dozen who had voluntarily surrendered in the previous six-month period left many wondering whether the FDLR were at all serious about their offer to lay down their weapons – an intention many had doubted from the outset. The joint SADC/ICGLR decision to accord the FDLR an additional six months took many by surprise, and was not supported by the UN Mission in the DRC (MONUSCO), under whose command the FIB operates. The UN Secretary General’s Special Representative to the DRC, Martin Kobler, and UN Peacekeeping Chief Hervé Ladsous both raised their voices in opposition, arguing that the FDLR had not demonstrated a commitment to the process and that the military operation should go ahead. The African Union, UN, European Union, United States and Belgian special envoys to the Great Lakes region agreed and have reiterated this many times since then, as has the UN Security Council – most recently when the 2 January deadline came and went with only 337 additional voluntary surrenders. Just what motivated SADC and the ICGLR to delay the operations is unclear. It seems unlikely that its member states really believed the problem was simply one of logistics, and that the FDLR just needed a bit more time to get organised. Then there is the disjuncture between the African regional organisations and the UN. Yes, SADC member countries – South Africa, Tanzania and Malawi – contributed the troops to the FIB, but the UN finances the FIB and has an international mandate to command FIB operations. That SADC and the ICGLR seem to have made the decision to delay an FIB operation unilaterally, without much coordination with the UN, further confuses the question of motivation. South Africa, Tanzania and Malawi have had time since their overwhelming victory against the M23 in late 2013 to digest the reality of going after the FDLR – a well-entrenched rebel group which has become part of the landscape in eastern DRC over the last 20 years, and which has social and economic links to the civilian populations as well as to Congolese government and military officials. The FDLR are dispersed across North and South Kivu, operate in small units and will be a much more difficult target to neutralise than the M23, which was essentially concentrated in one area at the time of its defeat. As a result, operations will be lengthy and complicated by the high probability of civilian casualties. The FDLR has used the local population as a shield in the past, and has perpetrated massacres to prevent military action against it. The 2009 military operations against the FDLR displaced close to a million people, and humanitarian organisations are concerned that widespread fighting will disrupt ongoing relief operations to a population already heavily burdened by 20 years of cyclical violence. It seems the countries contributing troops to the FIB now lack the will to wade into such complicated terrain. Tanzania has expressed reserve about the operations against the FDLR. And South Africa has shown itself increasingly reluctant to engage in an operation that has an uncertain outcome at best, especially if it cannot count on the military support of its FIB partners and the political backing of the rest of SADC. These are all important concerns, and ones that SADC, the ICGLR and the UN should be considering very seriously. The problem is that they are inherent to the one-track military solution that these regional and international bodies chose in 2013 when they created the FIB. At the time the M23 was at the height of its powers, winning a string of victories against the Congolese army, and an incensed SADC decided to ride to the rescue of its largest member state. Many elements in MONUSCO, its reputation again in tatters following its failure to prevent the M23 from taking Goma in late 2012, were only too happy to receive support from an aggressive military force that could take the actual fire along with the blame if matters did not work out. Today the clock is ticking on the FDLR issue, overshadowing other, more important or pressing issues in the eastern DRC and creating widespread panic among a civilian population that expects the worst once operations are launched. All eyes would have been on SADC member states and their counterparts from the ICGLR at the planned joint summit. It was hoped that SADC would propose a more holistic approach to disarming the FDLR. Simply extending the disarmament deadline again will only prolong the agony and discredit the organisation.